Islamophobia is mounting in the developed world, with a big contributing factor being ignorance. Without understanding the true religion, the West has wrongly formed an ignorant opinion of Islam, associated with terrorists who have no right to be called Muslims. Recently, Huma Abedin, a Muslim woman, who is deputy chief of staff to Hilary Clinton was accused of having ties with radical Islam. Five prominent members of the Republican Party and congress sent a letter to the Deputy Inspector General of the State Department, accusing Hilary Clinton’s aide Huma Abedin of ties with the Muslim Brotherhood. From the members of the Republican Party who signed this letter, the most prominent is Michele Bachmann, who was being considered by the Republicans as a presidential candidate. The Muslim Brotherhood is a political Islamic organisation which was founded in 1928, particularly very active in the Arab world and has been accused of an ‘international plot to overthrow governments of Arab countries’ by many, including the Dubai police. According to the letter sent, Abedin’s three family members specifically her late father, mother and brother were directly connected to the Muslim Brotherhood in Egypt. The inclination given is that Abedin has influenced the softening of policy in the White House towards the Muslim Brotherhood which can produce hazardous results for the US since the Muslim Brotherhood intends to destroy western civilisation from within. 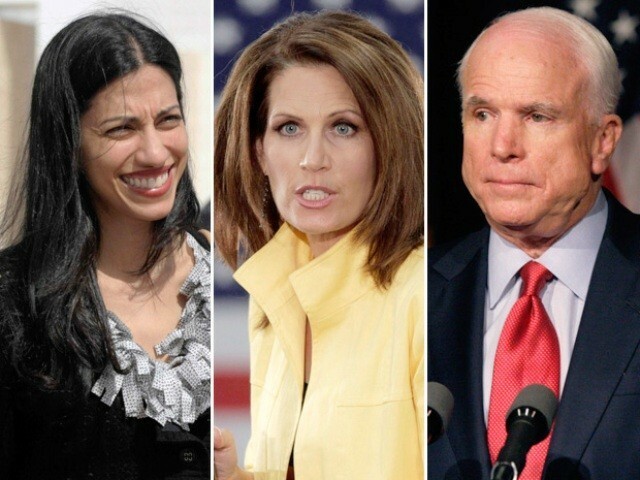 Not all Republicans have attacked Abedin’s reputation, with Senator John McCain amongst others rising to her defence. “These attacks on Huma have no logic, no basis and no merit. And they need to stop now,” McCain had said. Killing of innocents by so-called Muslims does not reflect what Islam teaches. Although jihad is a part of Islam, it has nothing to do with killing innocent people. Besides, what about the good that we’ve done? Why must the true spirit of Islam be overshadowed by those killers, terrorists and intolerant fanatics who have no right to be called Muslims? It does seem a bit preposterous that Abedin would be connected to the Muslim Brotherhood, or have an extremist Islamic agenda. The woman’s dress sense, to begin with, isn’t very modest according to Islamic standards as seen by her photo shoot in Vogue Magazine in 2007, where she wore a daring low cut red dress. She is also married to a Jewish man and has a baby with him! That said, the issue is deeper than just one person. The letter actually accused quite a few people indirectly, and the reason why Abedin was brought to the limelight is that her name was specifically mentioned. There is an underlying fear that Islam poses a threat to the western style of life – a fear which refuses to rationalise the fact that Muslims have been living peacefully in the west for hundreds of years. This is due to ignorance and it is this ignorance about the true meaning of Islam which is in dire need of being addressed in order to avoid such fear and misunderstandings in the future. Read more by Amna here. Dear writer, to tell you the truth it does not matter what you think. So what if you say that the “Muslims” who commit terrorist activities and suicide bombings are not really “Muslims” but trying to defame Islam. They say that they are Muslims and that is all that matters. You can go around telling people that they are not but at the end of the day it wont matter a bit. The kind of Islam we see on TV, the Muslim brotherhood, The Taliban, Women in veils etc. In Muslim countries homosexuals are killed, women are subjugated and there is a lot of barbaric behavior which Islam was actually supposed to change. This Islam IS a threat to the western style of life. Why is it that Muslim countries require immigrants to conform to their ways, but when they go abroad they want special privileges? There is a lot wrong in the Muslim community. We have to accept that and change that, once that happens peoples perceptions will change automatically about Islam. I agree, but Huma Abedin needn’t be defined by the acts of extremists who may share the same religion as her. Stereotyping, and hating somebody on the basis of his/her religious faith is, and shall always remain, unacceptable. I concur with whatever you’ve said, although the no-true-scotsman fallacy is getting way to common and needs to stop. You can’t call somebody a “so-called Muslim” or “having no right to be called Muslim”, just because they don’t fulfil your expectations of what a Muslim is supposed to be like. The solution is simple, either the muslims stop following God’s command and copy their hosts lifestyle and please their hosts in these countries or else face the backlash they are facing. The other solution is that the hosts (local population) stop their resentment towards practicing muslims which is definitely not possible as history tells us. A most comprehensive and accurate post – couldn’t have said it better. The problem is replicated in practically all countries with a sizeable Muslim immigrant population. Have seen this first hand in my neighbourhood in Canada. There are equal or larger immigrant groups belonging to other religions, and such issues are very rare among them. Why? Your attitude is precisely why ‘Islamophobia’ as you call it, is on the rise. There are many non-Muslim teetotallers (abstaining from alcohol) here but they are never looked down upon. On the other hand, why should a local univ/office have a special prayer room, why should a school cafeteria be required to serve halal meals when less than 10% of the kids are Muslims, why should a 10 yr old Muslim kid be exempt from a school’s music / swimming class because ‘music/swimming attire is against their religion’? These examples are not pulled out of a hat but those I know of firsthand – and there are many more. Recently another blogger on this site wrote about how she was surprised at reactions from people when all of a sudden she went to work in a full burqa – really, what was she expecting? It is an absolute reality what Amna mentioned, there is underlying fear that Muslims are attacking western lifestyle and trying to bring fifteenth century Islam right at their door steps. The initial response is coming in the form of legally banning ‘burka or hijab’ and wrinkled foreheads or cold shoulders or recent spying on Muslims in New Jersey or New York. If we do not change ourselves others aught to react the same way in the end. Representative Michele Bachmann is just playing politics as any desperate politician will to gain some lost popularity otherwise majority knows how moderate intelligent and a decent American Muslim Huma Abedin is! Some one mentioned Hijab. No one forced Huma Abedin (shown in the picture) not to wear Hijab? No one forced her to marry a Christain Anthony Weiner. Pakistanis and Afghanis know the meaning of true Islam. World can see what Islam is by watching how its followers live their lives in Islamic countries like Pakistan and Afghanistan. Hmm…let me say this without mincing words. Amma says jihad and fighting to convert the world to Islam is not part of Islam. We then have countless Imams, Mullahs, Ayatollahs, and respected religious scholars who have dedicated their entire life to studying the Koran, know Arabic, study the religion since they were 5 years old, etc. And they all concur that we need to wage jihad to convert the world to Islam, since it is the true path. As I said in my earlier post, the solution to the problem lies not with the muslims living in the so called developed countries, but with their hosts. Could you please tell me if you had been to a European or US yourself or are you telling us what you hear from others.. The problem comes from the unbelievers hating Islam. Isnt the truth the vice-versa of it…If unbelievers really hated Islam,why is that the percentage of muslims are growing in non-muslim countries while decreasing in Islamic countries??? According to a Dawn article,most of the Canadian muslims are below poverty line and in another article I read that 5% of Netherlands muslims take up around 40% of social security benefits…In Britain,12% of jail inmates are muslims in a 2% population…. Whatever you say, the empirical evidence is too strong to counter this perception. Take the top 5 Economic powers in the world – India, China, UK, US and Russia. They ALL have been affected by Islamic Terror. India in Kashmir and state sponsored Terror from Pakistan, China in Xinjiang where Terrorists get training in Pakistan. US with 9/11, UK with 7/7 bombings, Russia in Afghanistan. So, tell me, what is the common strain between all of the 5 powers? Maybe you are wrong about the topic you talk about and the rest of the World is right. Maybe you are biased in your opinion and the Taliban are right. Have you ever thought about it? Its hard to accept something as untrue that you have believed in all your life, something your parents and peers have contributed in embedding the idea deep in your psyche. But, the empirical evidence is too strong. Yes. And when westerners go to the Dar al Islam they wouldn’t dream of defying their hosts. Bhai…I had a good laugh reading the last comment at your gullibility and narcissm… You’re talking as if the Arab countries are producing oil out of raw materials and providing to others like iphones,cars etc…whereas in truth,they are just lucky that they’ve a huge deposit of oil under their feet..
Also,they had it for thousands of yrs and were still driving camel,until two Europeans called Karl Benz and Rudoplh Diesel found the use of oil in transport..
Mate, your comment shows a gullible and slave to the west mentality. In today’s competitive environment, the middle east does not need the west to extract oil. China can do it better and cheaper…among muslim countries Malaysia has the Oil & Gas extraction technology…So its the western economies that benefit from middle east and not vice versa. Well the first thing before arguing someone on religion is to ask him/her that, do you believe in a Creator? Now as far as this topic is concerned, Islamophobia is something which is produced by the Media to misguide the western world. In no way Muslims are backward, obeying the divine laws doesn’t pull you back but rather sets you free. If people in here believe that by wearing fashionable clothes and driving luxurious cars make you somewhat modern then they are highly mistaken. Disobeying God will never bring you peace. Look at all the Muslim countries around the word, the Arab uprising is a mere example of the trouble the muslims are now going through to estabilish their lost faith. Michelle Bachmann, Lou Gohmert, and the other tea partiers are far right-wing conservative bigoted lunatics, more so than the usual prejudiced ignorant right-wing mainstream Republicans. You won’t get very far in trying to make them understand anything. Regardless, there is no denying the rise of right-wing religio-political Salafi/Sunni Islamist extremist ideologues worldwide. They have their own bigoted, paranoid and extreme dogmatic ideas and they speak loudest and unashamed in their hypocrisy on what the vague terms ‘true Islam’, ‘true meaning of Islam’ is as advertised in their hateful twisted rhetoric, threats and violence. People in most non-Muslim Western countries assess what Muslims do, not do, think and what they preach and say. Here are some figures what Muslims in the UK think. (UK data 2009). 81% of Muslims in Britain think of themselves as Muslim first. 40% of British Muslims want Sharia in the UK, and 28% of British Muslims want Britain to be an Islamic state. 36% of 16-24 year olds believe if a Muslim converts to another religion they should be punished by death, compared to 19% of 55+ year old Muslims, 13% of 16-24 year olds admire organizations like Al-Qaeda. 61% agree that homosexuality should be illegal, and 31 % agree that Muslim conversion should be forbidden and punishable by death. 68% of British Muslims support the arrest and prosecution of anyone who insults Islam. No one in the UK wants Sharia in the UK except 40% of the Muslims living there. Real thread No 1. No one in the UK wants Britain to become an Islamic State except 28% of the Muslims living there. Real thread No 2. No one in the UK wants the introduction of the death penalty for converts, but 36% of 16-24 year olds believe if a Muslim converts to another religion they should be punished by death, compared to 19% of 55+ year old Muslims (elder a lit bit wiser). Real thread No 3. No one in the UK admires Al- Qaeda, yet 13% of 16-24 year olds admire organizations like Al-Qaeda. Real thread No. 4. In the UK discrimination on the basis of both sexual orientation and gender identity is illegal in housing, employment and the provision of goods and services and the Armed Forces allows LGBT (Lesbian,Gay, Bisexual, Transgender) individuals to serve openly, yet 61% of the Muslims agree that homosexuality should be illegal and punishable by death. Real thread No. 5. So it is not in the first place about Mosques, hijab, alcohol, halal food, it is about Sharia, Islamic State, Al-Quada, homosexuality, death penalty. These figures are frightening and the younger these Muslims are the worse their opinions are. Most countries and most people don’t want this to happen in their countries. Thanks for the information (UK data 2009). It’s frightening to say the least. When you could not find any logical answer to my points, you closed the debate…shows that the hyped propaganda against the muslims and islam cannot stand against facts and logic. If muslims wanted,they could have used oil to dominate the world.Instead of dollars and pounds,the worldwide currency would have been dinars and Riyals…But the arabs know the fact that they’re totally toothless inspite of having oil as they seriously lack in science and development,so they decided to be a slave of US and Europe by restricting the sale of oil in dollars and pounds. and whenever a country tries to free from it,they are brought back to slavery like that of Iraq,Libya etc…They’re just a parrot in a golden cage and even if they get freed,they dont have the skill to survive in the wild. You are pathetic sorry to say. I am sure you were rejected western visa many times and now you have become hopeless. You know very well the long ques of Muslims outside western embassies dying to go and live in kaffir countries. Why? Because westerners have made paradise on earth which attract everyone specially Muslims. Please tell your Ummah brothers and sisters to immediately leave kaffir countries and return to their loved homelands where there is no education, water, electricity etc. 30 years back sheikhs had no oil and west was already developed. Also gulf sheikhs depend on west once they got oil. Because their economies run on oil. and for god’s sake, arabs did not know difference between camel piss and oil until it was dug by the western companies.